The Northcote Cougars holds Auskick clinics for a range of age groups (5 – 10 year olds). In 2017 over 250 Auskickers participated in the Northcote Cougars Auskick Program. Our groups include an “Academy” Group which is for basic beginnners generally in Kinder or Prep, a “Reserves” Group which is for those building confidence and begining game play (Generally Grade one and two) and a “Seniors” Group which is for those who have the mastered the basic skills and are begining to focus on stringing them togeather in game like situations (Generally confident grade two and up). We also have a dedicated Girls Academy group for girls who want to learn the game with other girls. In 2019 we aim to again increase the number of Girls participating so that there are plenty of young girls coming through to the ever-growing junior girls football teams including the AFL in the future. To support greater Girls participation, as well as the mixed groups, Northcote/Thornbury Auskisk also as runs a GIRLS ONLY clinic each week (for those girls who prefer this). Girls are still welcome to train in the mixed-class groups if they prefer. In 2017 we had about 20 Girls each week Training in the Girls group. During the year as players skills developed some choose to join the other more advanced groups and some even went on to traing and play with the Cougars underaged Girls teams who play on a sunday. So any girls who want to start their footy career head come down and have a go in a safe non-competative environment and if you like it we will find a spot which best suits your skills and ambitions. While its not everyone’s dream to play junior footy (and there is nothing wrong with just having a kick in the park) for those who are interested making it all the way to the AFL, the Northcote Auskick Centre is a part of the Northcote Junior Football Club program which provides a great pathway to Junior and Senior Footy. 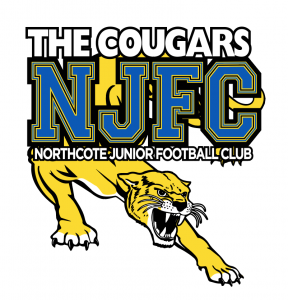 Being a part of the Northcote Cougars provides a great opportunity for older Auskickers to see what junior footy is all about, and easily transition if that’s your thing. As with all Auskick centres Northcote Cougars Auskick is run by parent volunteers and generally the participation of parents is fantastic. Every year however, as their children move on, so do the parents that make Northcote Cougars Auskick such a great experience for the kids. So we always need more help to keep the centre going. Whether you are a first time participant or returning from last year we always need more help with coordinating events, setting up, coaching, assistants, running the canteen or packing up. As well as registering your children for the clinic be sure to also let us know (by emailing northcote.auskick@gmail.com) how you can think you can help so we can get you involved. Leaving it to the first day is hard to coordinate, so drop us a short email ahead of time and we will be in touch. Registration for 2019 opens in February 2019. The registration cost of $100 gives access the 15 clinics plus a pack full of goodies (including a football). The packs are new and improved for 2019 and are themed around each individual auskickers team that they support. Registered Auskickers and their families also get four free tickets (two adult and two children) to a selected AFL match.